WASHINGTON (CNN) -- Canada geese got into both engines of US Airways Flight 1549 and forced the plane to ditch into the Hudson River last month, the National Transportation Safety Board said Thursday. Surveillance video shows passengers of US Airways Flight 1549 hurrying onto the plane's wings. The flight crew of the Airbus A320 put the plane down gently on the river, which separates New York from New Jersey, after the bird ingestion caused both engines to lose power on January 15. 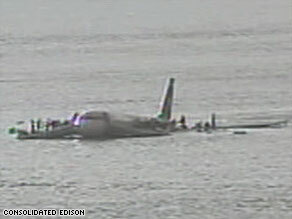 All 155 people aboard survived. Adult Canada geese weigh between 5.8 and 10.7 pounds, although birds from resident populations rather than migratory populations can be heavier. The plane's CFM56-5B/P turbofan engines were certified in 1996 as being able to withstand bird ingestion of 4 pounds. The NTSB said last week that both engines contained the remains of birds, confirming the pilots' report that the engines shut down after colliding with birds less than two minutes after taking off from from New York's LaGuardia Airport. Material from both engines was sent to the Smithsonian Institution in Washington for identification of the bird species. Investigators have not yet determined how many birds hit the jet's engines. The plane's flight data recorder "revealed no anomalies or malfunctions in either engine up to the point where the captain reported a bird strike, after which there was an uncommanded loss of thrust in both engines," the NTSB said last week.